Another interesting item to hit the eBay auction site. A "Lectuas" Spanish magazine issue #800. 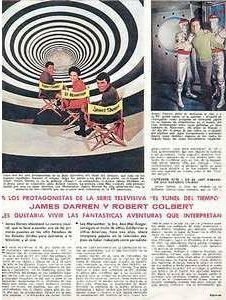 Released on August 18, 1967 and includes 58 pages on the Time Tunnel TV series. The magazine measures 9.6"x12.4". Foreign countries are slow getting on line, and on eBay for auction trading. More foreign items are starting to surface on eBay, making the enjoyment of collecting more exciting.